As I have mentioned in a previous post, if there is some event to celebrate or if I desire to personalize a purse for a friend or loved one, I always shop my sources to see if there are any cigar, tobacciana, or other ephemera that fits and I am often rewarded with a match. My step mother’s name is Julia and there was a label bearing the name with a sweet scene of two love-birds smooching. It was perfect. These are also some of my favorite papers and colors, particularly the yellow. I am so happy with how this one turned out. Lots of fleurs, roses, rhinestones, vintage scraps, vintage handle and an upholstery tassel. Happy Birthday, Julia. 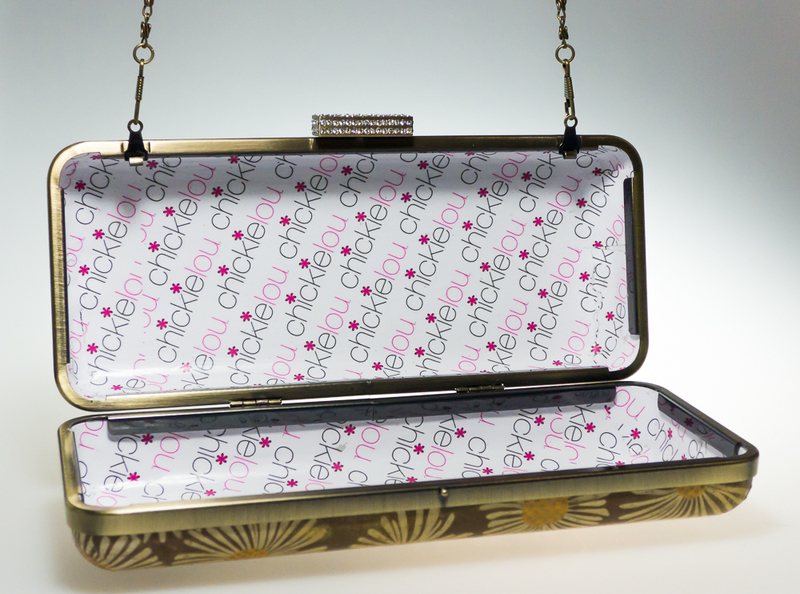 Another hinged-flap purse. This purse’s paper from World Market is a clue to why I call it Pucci-esque. It’s mod, bright, colorful and has an Italian flair to it. The gold paper tape trim is vintage French wallpaper stripping. Now, I confess, I don’t really know what that is. Perhaps it was a tape strip that is applied over the seams where two sheets of wallpaper meet on the wall. I am just not sure. I acquired this style plus two other different styles from an Etsy seller in France. And if I recall correctly, the seller’s name was Sonya too. Just a neat coincidence. Those are small gold coins glued at intervals over the tape and a vintage handle. I just love the Spring colors. Here are the group of three “mod” purses in a group shot. Bloomberg on the left, Pucci-esque in the back, right, and Marlo in front. When your friends get two new adorable Brittany Spaniel puppy brothers, named Pancho and Dash, it is normal for my mind to search for a way of commemorating the event with a cigar box purse. (Heh. Okay, I guess that’s just me.) But, oh my gosh, how lucky was this cigar label find? Two puppy brothers, one darker with a blaze on the snout. I swear, it was a random find. I did not draw this thing. I couldn’t, even if I tried! And of course, the design of the purse had to be sporty, with houndstooth and plaid. But also feminine because these boys’ moms are about as feminine as the come. I’m sure I couldn’t even come close to making this as stylish as they truly are. But it’s okay because… PUPPIES!!!!!!! Here is Marlo. 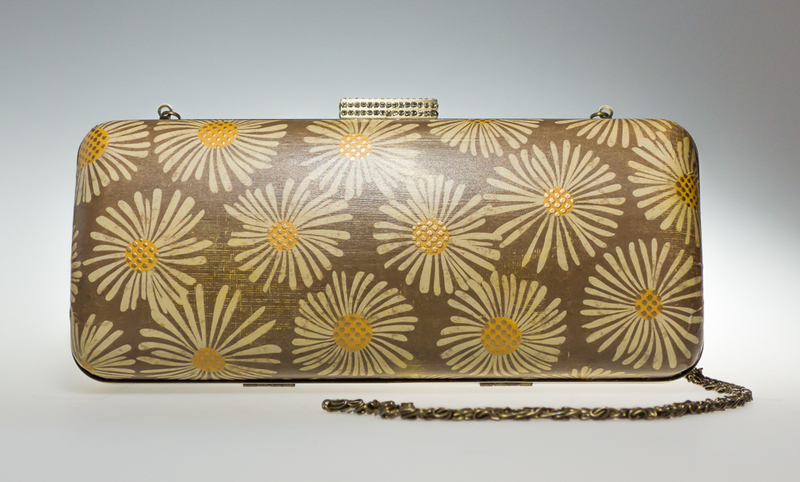 A mod little hinged flap purse. Paper is from World Market, scrap trim, coins and a large tassel from an eBay seller. Handle was purchased with pony beads included. Here we have beautiful Claire. 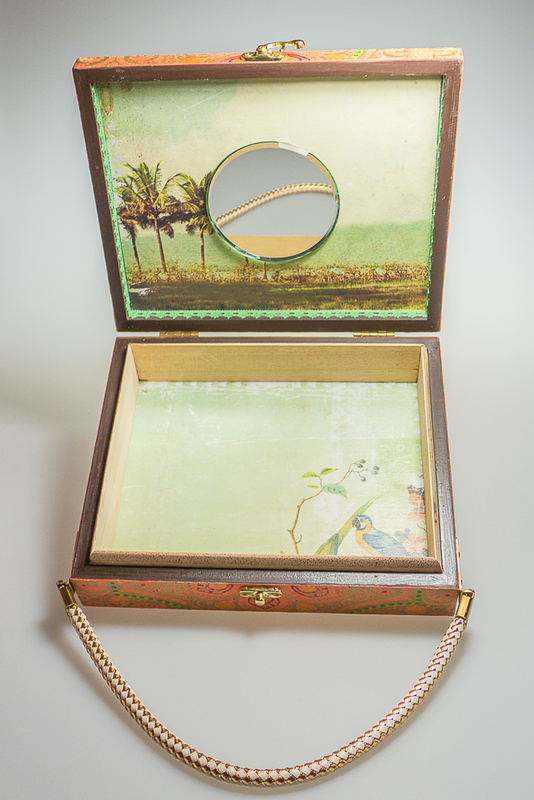 With lots of trim, coins, fleurs, pearls, and a whimsical bird bath scene on the interior surface. It is a smaller purse and the bird bath inside was so lovely and large, thus this would be one of the few purses I made without a mirror inside. It just didn’t fit. This is Bloomberg, named simply because I was watching a lot of the channel by the same name on my iPad in my studio as I made this. Why? I really don’t know. It’s a one-off, I suppose. This is a World Market paper with “blooms” on it. German scrap painted a shocking fuschia pink was applied to the edges along with a vintage shelf edging “lace” (the “woven” looking blue and white border on either side of the front and back). The latter was a little too yellowed and aged for my liking, but I tried to whiten and brighten it with paint. Vintage handle. This one will probably stay in my private collection, because you know…PINK!!!! And now, for something a bit different. Here is a “purse” I created that was meant to hang on a wall. 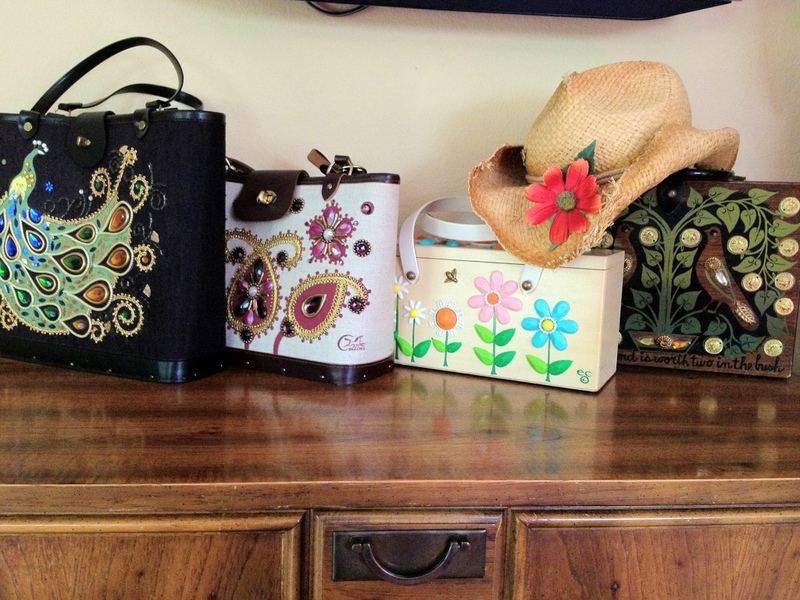 One of the things I love is displaying both my purses and my collection of Enid Collins purses on the wall (with a shout out to my very tolerant husband). This inspired me to make a purse (or is it a clock?) for my sister-in-law Kathy as a sort of house-warming gift since she recently moved. I just LOVE how it turned out. I’m figuring out how to make a desktop version! Well, that’s all for now. I have other purses to blog, but need to schedule photography day for them. Thank you, friends, for your encouragement and positive comments. It means a lot to me. I’ve been struggling with several health issues, most aggravating being a bad case of tendonitis in my dominant hand. I find it very hard to limit my activities in the studio, but I did break down and buy a power screwdriver. Hand therapy continues apace (relief coming at a GLACIAL pace) and I’m trying to stay positive. Soon I will have to start working on the financial books for my family’s business, to hand off to my accountant for the end of the year, so purse blogging may slow down once again. One thing I will try to do is be more present on my Facebook page. You can try following me there. Be well! Here is is, hanging “in situ”. Earlier this year, my friend Charlie asked me to make a purse as a surprise for his wife, Barbara. He provided me with a stack of her favorite nature and bird oriented greeting cards to choose images from. Together, we selected this beautiful image by air brush artist Wendy Morgan to make into a cigar-styled label for a purse. For the image itself, I only gave it an aged look and then added the bijoux and some jeweled eyes and a rather generic “Havana Finest Cigars” graphic. The paper I used for the interior is one of those lovely World Market papers I am so fond of lately. I am very pleased with how it turned out. Barbara was thrilled and very surprised! The back of the greeting card, giving credit to the artist, Wendy Morgan. Oh Boy… So behind. So… so behind. Here we have a purse I made for a friend Betsy. Betsy and I met online through a group dedicated to supporting a favorite big cat sanctuary. 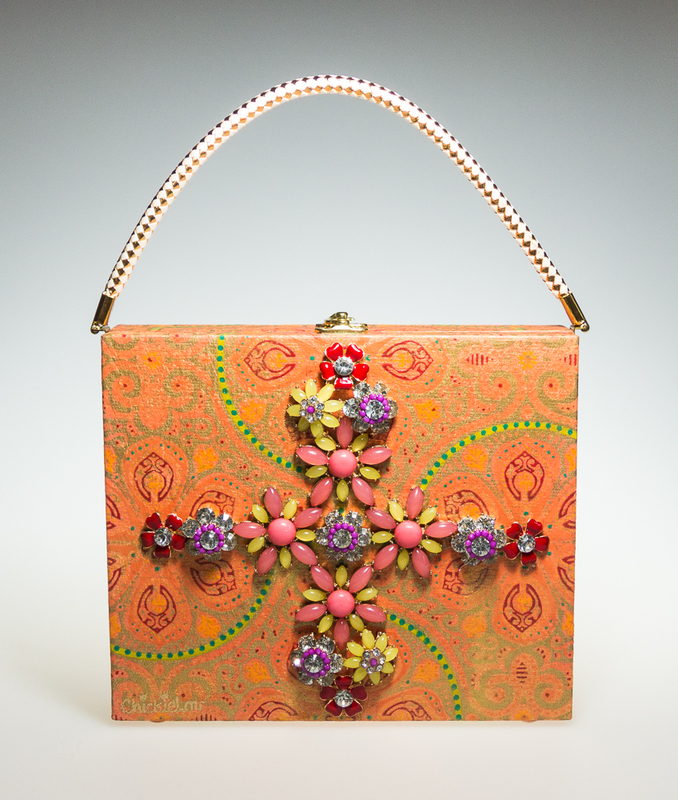 So, it only made sense when Betsy was faced with a health crisis that any purse I made for her be beautiful and empowering, embodying strength and grace. And have a pacified tiger on it! This old label was something I had acquired a couple a years ago. I don’t even know if it is a cigar box label. It had no text on it. But hey! That just meant I could add my own. So I give you… Betsy’s Victory! Betsy, if you are reading this, may this beauty of a purse carry your strength and victory on those days when it’s hard. I wish you only the best of health. This one is for fun. A hexagon shape with a wrist strap. The tassel is dyed horsehair. Here is a recent bag. The paper is a handmade one I got from World Market. The stones are a junk jewelry necklace I acquired from eBay and cut apart. The handle is NOS. I thought the overall effect was very glam. I’m trying to catch up. One bit of (now old) news is that I moved households. Like 6 months ago! So, I have been making purses. And taking photos of them. But blogging? Nay. And I see the WordPress interface looks nothing like its former self, so I have no idea what I am doing. I have to learn it all over again. Six months WP people! I’m lost. So let me start with this little purse. I gave it to my former neighbor who is affectionately called “Sundrah” by her hubby. I miss those guys so much. But she has a purse to remember me by. And I hope you like it too. The wee collection grows. The “Peacock Bag” is not actually an EC bag, but a collectible kit bag, inspired by EC bags back in the day. My sister had the identical purse. She did all the embellishing, following the instructions to the letter. Every time she and I got into a fight, I would slyly pick one or two of the stones off and throw them out until the purse was destroyed. I could kick myself now for it. Anyway, about 8 years ago, I was walking around in Petaluma, California where I lived for a time, and there in an antique store was the bag you see here. In all it’s glory, with every stone intact. I bought it along with a genuine Enid Collins bag. I kept the peacock knock off and gave the EC bag to my sister, by way of an apology for being a horrible kid sister. By the way, I composed and published this post using WordPress for the iPhone. I hope it helps me to be a better and more spontaneous blogger. We will see.